Join the discussion on our forums! Come discuss Dinomancy over in our dedicated Dinomancy discussion topic. 54,3% Meta Defining OMEGA LUL! No one uses it competitively for the simple fact that if you get cleared from the board you've basically fucked yourself over with no useful hero power. Everyone seems to like this card. It's a nice design - forces us to pick between to great hero powers. But...no one plays it. 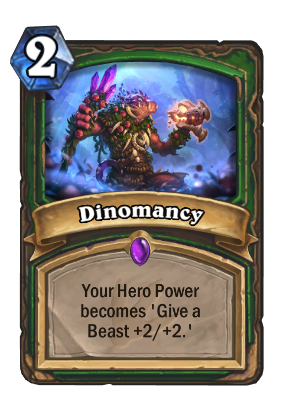 Dinomancy should be a 1-cost card. 2 mana for Hunter is too expensive. You really want to play this early game, but you can't because Hunter HAS to get something on the board early. As a 2-cost card, you almost want to mulligan it away. Does this stack with itself in any way? Or is a second copy just dead? 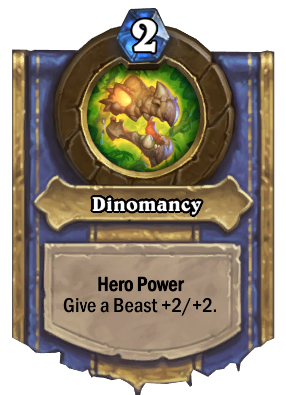 Second copy allows you to Hero Power -> 2nd Dinomancy -> Hero Power again, which allows for some stupidly good trades or a little more reach. It seems that only the first hero power counts towards "Use your hero power X times" quest. So, if you used Steady Shot and then Dinomancy, only Steady Shot will get counted. But if did not used Steady Shot before using Dinomancy, all Dinomancy usages will count towards quest then. There isn't a quest that says to use your hero power X times. Use your Hero Power 30 times. Thought you meant hero quests, my bad. In case anyone was curious, the golden version of this card will turn your Hero Power golden even if you don't have a golden Hunter hero. I'm 150 wins off of golden Hunter so I can't test what happens to your (already golden) hero power if you use a golden or regular version of this card. This is not my favorite card. Only Barto can Buff this card, so why i need two from it?! Yeah, I'm just making a better version.